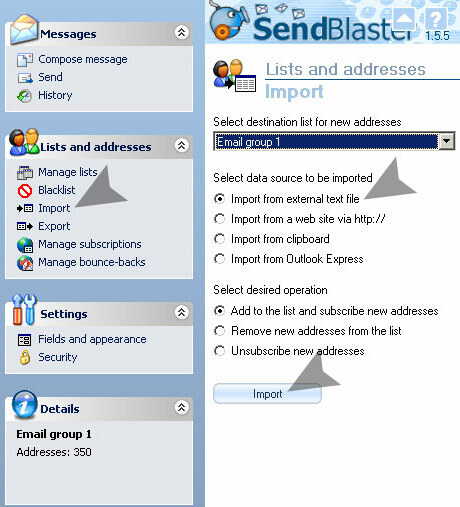 SendBlaster makes it easy to import your mailing list email addresses and contacts. In this post we’ll explain how to do it. Easy and Hassle-free guaranteed! Step 1. Exporting your contacts from your mail account into CSV file format. To import your contacts into SendBlaster you need to export a .csv/.txt file (one record, on each row, fields separated by comma, semicolon or tab) from your mail account, and then import it into SendBlaster. Login to your account and go to Contact list. You will get a CSV file downloaded which has all your contacts. Hit Export Button: this will open a new window asking you either to open or save the file. Click Import/ExportExport from the main menu. Choose Comma Separated Values (Windows). Select ‘Contacts’, and save the exported file. Now choose the CSV file stoed in your computer that you want to import. Well done! Importing CSV and TXT files is complete. You can find your imported email addresses and contacts into “Manage Lists” section. Now you are ready to create and send out your mass mails with SendBlaster!